Can you believe Christmas is this week? We are all ready for Christmas at our house. The presents are wrapped, the menu is planned, the stocking are hung, and it’s snowing outside. Now we are just enjoying the time as a family and baking something delicious. I love Christmas baking, but I can’t believe it has taken me until the week of Christmas to share something chocolate and peppermint with you. I live on chocolate and peppermint during the Christmas season. 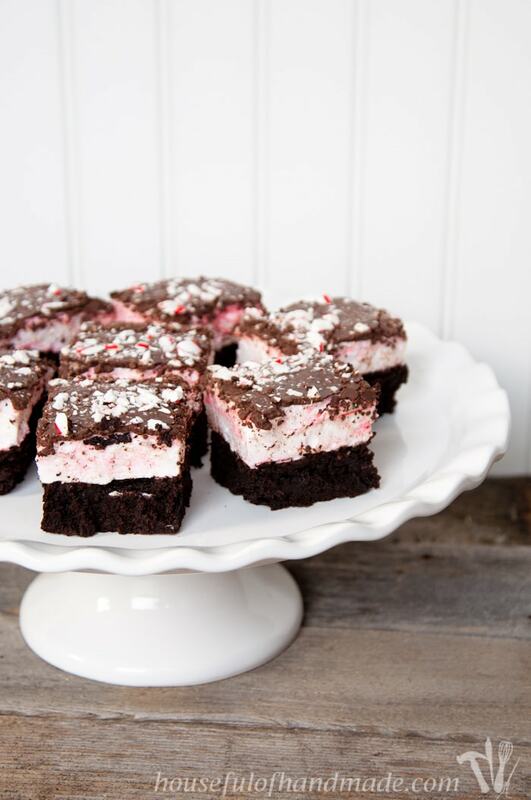 Peppermint mochas, peppermint brownies, peppermint candies, I love it all! 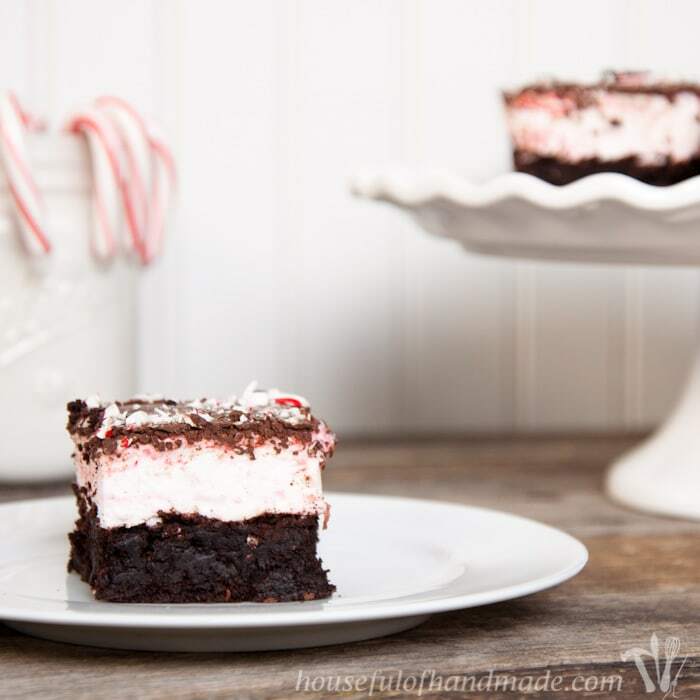 So today I am finally sharing these delicious Chocolate Peppermint Brownie S’mores Bars. I have been baking up a storm this month, mostly just to keep the house warm. Nothing heats up the house like having the oven on. I hope I’m not the only one who does this 🙂 But since it’s been really cold, I’ve had to do a ton of baking. 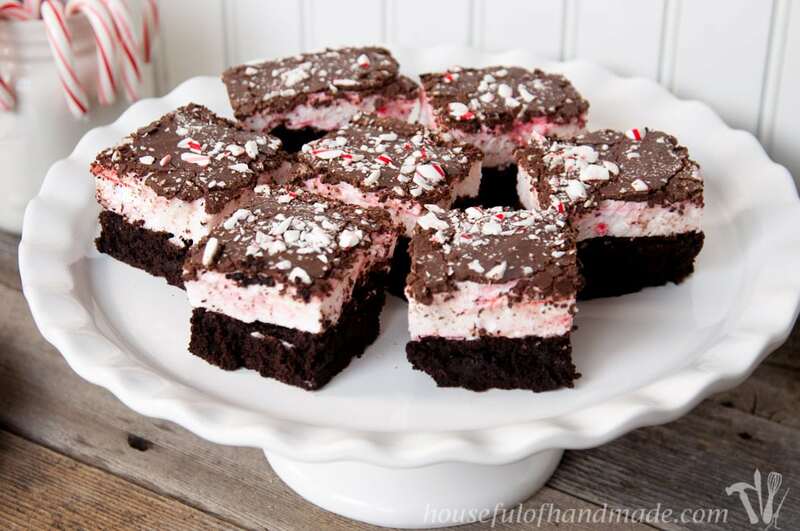 I knew I wanted to make some peppermint brownies for Christmas because it’s not Christmas without peppermint. But I wanted to do something a little different. I am a huge fan of homemade marshmallows. If you haven’t tried them yet, you are missing out! They are so much better than the ones you buy in a bag, and you can flavor them however you like. So I figured it would be even more delicious to top my Christmas brownies with peppermint marshmallows instead of frosting. Boy was I right! I want to do you a huge favor and tell you not to make these brownie s’mores bars. Why, you ask? Because they are so delicious you won’t be able to stop eating them. I would recommend making them for a get together. 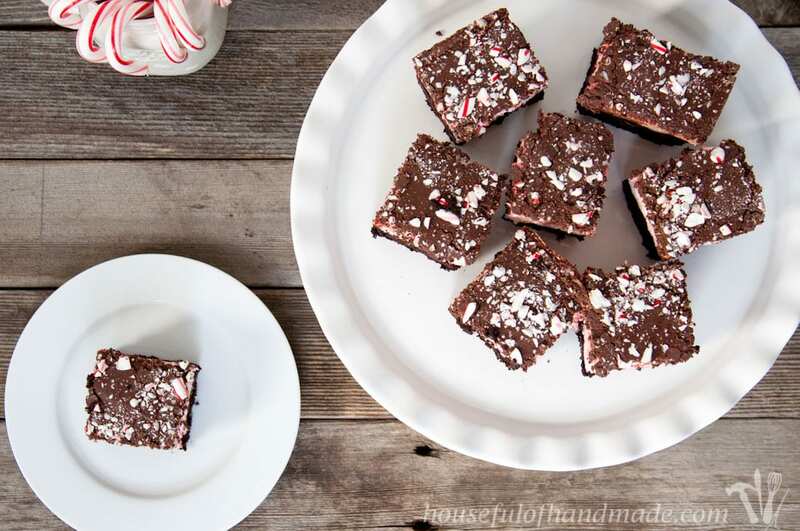 Or go ahead and make them, then curl up with the pan and indulge, it is Christmas time! 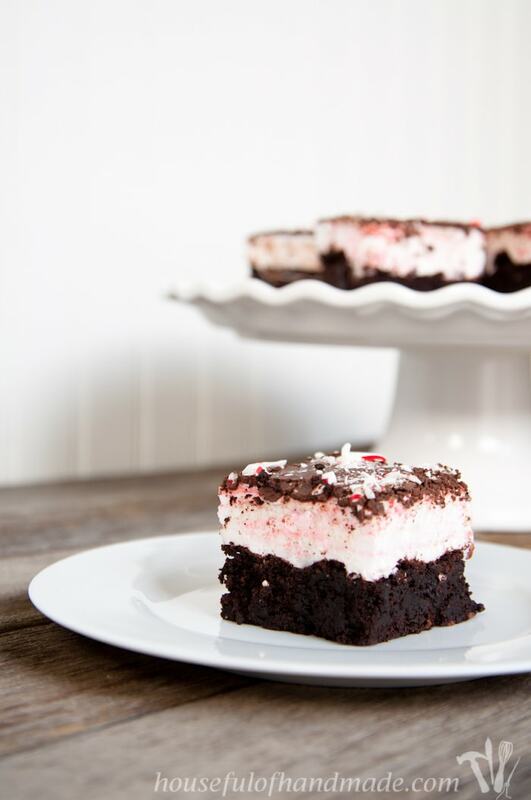 The 3 layers of these chocolate peppermint brownie s’mores bars are a match made in heaven. Start with a nice thick chewy brownie. Top that with a fluffy peppermint marshmallow. Then finish it off with a layer of smooth chocolate with a sprinkle of candy cane! Everything you need to stay warm this winter. Since these brownies are a 3 layer process, it will take a little time to make each layer and wait for them to cool before you move on, but they are really easy to make so don’t let the list of steps scare you away. I found if I baked the brownies the night before, then they could cool over night and you can top them off with the marshmallow and chocolate layers the next day. Sift together coca powder, flour, baking powder and salt. Set aside. In a large bowl, stir together sugar, eggs, butter, and vanilla extract. Do not beat or over mix. Stir in flour mixture, careful not to over mix. Pour batter into greased 9x13 baking dish. Bake for 30-40 minutes until toothpick inserted in the center comes out clean. Place gelatin and 1/2 cup water in the bowl of a stand mixer fitted with a whisk and allow to bloom. In a small saucepan, cook 1/2 cup water, corn syrup and sugar until it reaches 240 degrees on a candy thermometer. Turn stand mixer on low and slowly pour hot sugar mixture into gelatin. Once all the hot syrup is poured in, turn mixer to high and whisk until light, fluffy and warm to the touch (about 5 minutes). Add peppermint extract and beat for 1 more minute. Remove whisk and drop 5-10 drops of red food coloring around the marshmallow. Stir together with a spatula leaving streaks of red and white. Let rest for a couple hours uncovered. Melt together the chocolate chips and coconut oil. Spread over the top of the marshmallow layer. Sprinkle with crushed candy canes. Allow to harden before cutting. I hope you enjoy your Holiday and lots of Holiday baking! Hard to believe that you started your blog just last March! Well, I only discovered that there was such a thing as a blog last March! How crazy is that! Your family is adorable, love your blog, and recipes. How the bloggies with small children and some with out of the house jobs or careers do it is absolutely amazing!Ten in the evening on Christmas Eve and not even showered yet! In the kitchen most of the day!Blessings to you and your family and Best of wishes for continued success,health and prosperity in the New Year!! Blessings to you and your family too! I spent all day in the kitchen on Christmas eve and the day before too! Isn’t getting ready for Christmas fun (and a lot of work!)? Thank you so much for following along with my adventures, I truly love sharing with you! Kati, this brownie looks superb! 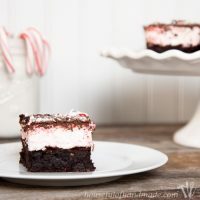 Although I am not a fan of peppermint, but this one with brownie look like something I would love! Hahahaha. Love that you are baking to keep the house warm. I bet the house smells fantastic with all those baked goods too! Thank you! My sister wants to make the brownie s’mores again but with your orange marshmallows instead of peppermint. Chocolate and orange would be delicious too 🙂 And it’s a cold one today so I am doing a lot more baking! 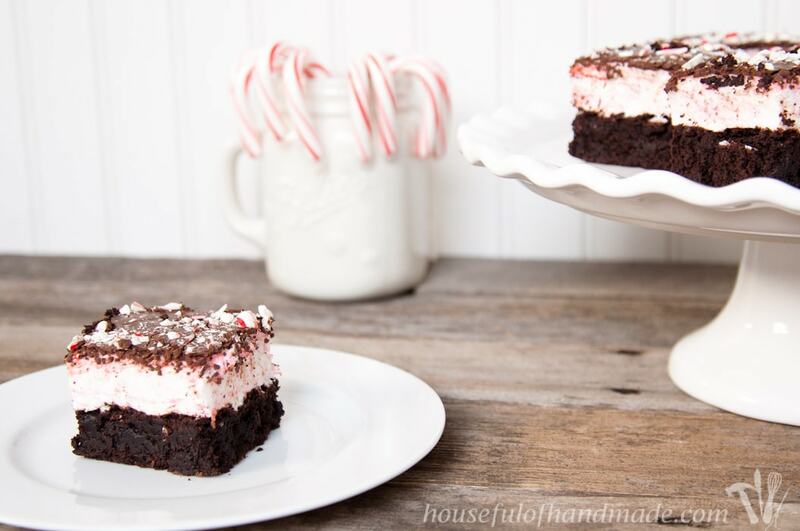 I have been loving brownie and peppermint together this season! I love the s’mores take on this recipe. It looks so good!